The Chicago Department of Transportation’s proposal for a neighborhood greenway on Manor Avenue is endorsed by 33rd Ward alder Deb Mell and the ward’s Transportation Action Committee (I am a member of the TAC). But the initiative is facing fierce opposition from some Ravenswood Manor neighbors who object to plans for traffic diverters at Manor and Wilson Avenue that would eliminate cut-through traffic on Manor. Unless more residents voice support for the diverters, the greenway project will be watered down and it won’t reach its full potential to make Manor safer and more pleasant for homeowners, people walking, and bike riders. At last week’s Mayor’s Bicycle Advisory Council meeting, Mike Amsden was open about the fact that the greenway project, part of a larger plan to for an on-street bike route connecting a multi-use path in Horner Park with the North Shore Channel Trail, has been “controversial.” Starting next Monday, September 19, CDOT plans to test the diverters, which will prevent motorists from turning from Wilson onto Manor or crossing Wilson on Manor, using temporary infrastructure. If the pilot is deemed successful, CDOT would install landscaped curb extensions to take the place of the temporary barriers. Other elements of the greenway project include raised crosswalks and concrete islands at Montrose and Lawrence Avenues to slow down motorists as they enter Manor. “[The Manor greenway] is an incredible project that’s going to provide a really important connection between Horner Park and Ronan Park and serve as an extension between the river trails that are out there,” Amsden said. He also acknowledged that the plan has faced stiff resistance from some residents. At community meetings for the project, some neighbors have said they didn’t like having their driving route options limited, and expressed concern that significant amounts of cut-through traffic would wind up on other nearby streets, reducing safety and quality of life along those roadways. The purpose of the two-month test is to see what effect the diverters have on traffic levels on the surrounding street grid. CDOT has projected that some nearby streets would see a small increase in traffic, but that many drivers would simply stop using Ravenswood Manor as a pass-through between Montrose and Lawrence. However, someone has been circulating a misleading flyer about the project in the neighborhood, which isn’t helping residents make informed decisions about the plan. “The closure will deprive all residents who live near Lawrence Avenue with one of the only thoroughfares [that] connects Lawrence to Montrose Avenue, and the majority of Albany Park to the rest of the city,” it states, disregarding that no blocks are being closed. In addition to the fact there will still be options for traveling between the north and south segments of Manor, such as jogging west on Wilson and Francisco Avenue, there will still be plenty of other options for traveling between Lawrence and Montrose in the vicinity. Within the mile-wide stretch between Kedzie and Western Avenues there are three other continuous north-south routes connecting Lawrence and Montrose: Albany Ave. (northbound), Rockwell St. (southbound), and Campbell Ave. (southbound). 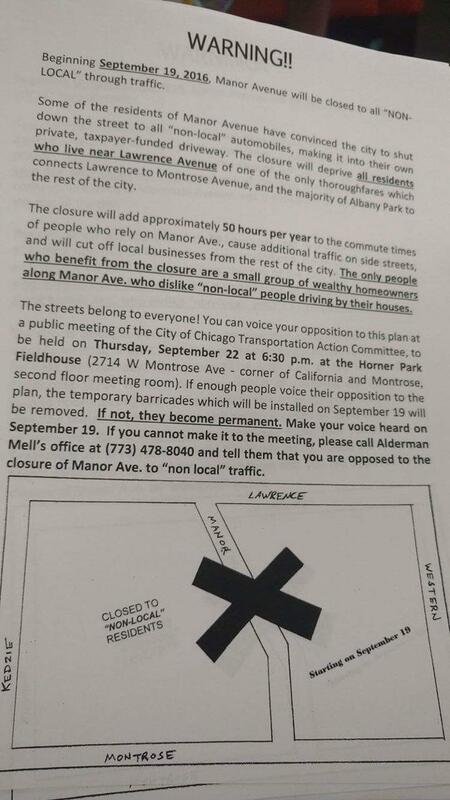 “The only people who will benefit from the closure are a small group of wealthy homeowners on Manor Ave. who dislike ‘non-local people driving by their houses,” claims the anonymous author of the handout. While it’s true that those who live on Manor will benefit from a safer, quieter, and less polluted street, the avenue will still be available as a walking and biking route for all residents. That includes folks from other neighborhoods who will begin using the street as a low-stress “8-to-80” bike route between the two off-street trails, suitable for seniors and families with kids. And then there’s the highly dubious claim that banning cut-though traffic on Manor will add 50 hours a year — 12 minutes per workday — to residents’ car commutes. An anonymous “scare flyer” was distributed in Ravenswood Manor. Note that Wilson, a major east-west access route for the neighborhood, as well as the four other continuous north-south streets between Kedzie and Western, aren’t included in the map. Shortly after the ward office created a special email address to receive feedback about the project last, there was a nearly equal balance of support and opposition to the diverter test, according to aldermanic assistant Jeff Sobczyk. During the past two months, as the plan has garnered more media coverage, Mell’s office has been receiving more and more emails arguing against testing the diverters. The next meeting of the 33rd Ward TAC will be on Thursday, September 22. The flyer states that “If enough people voice their opposition to the plan, the temporary barricades [that] will be installed on September 19 will be removed.” They’ll be removed on or around November 19, two months after the trial begins. However, without an outpouring of calls, emails, notes, or visit to Mell’s ward night on Mondays, from residents who think the greenway project should move forward, it may be politically necessary for Mell her to pull the plug. What a waste that would be for everyone who put time and effort into planning the project. “I’ve been through this rodeo [of trying to get traffic calming installed in the neighborhood] before,” someone shouted. Mell said at the August 26 meeting that she’s not ccertain that CDOT’s plan is the best solution, but she thinks it makes sense to give it a try. “I’m asking you to keep an open mind, and let’s see how it goes,” she said. The September 22 TAC meeting takes place at the Horner Park field house at 6:30 p.m. If you can’t make it, email your comments to Mell’s office at manorgreenway@gmail.com, and to CDOT at cdotbikes@cityofchicago.org. You can also call Mell’s office at 773-478-8040, or come to ward night on Mondays from 5 p.m. to 7 p.m.
Let’s be honest – there are many streets in Chicago that were not designed for the amount of traffic they handle today. Car ownership has more than doubled nationwide in the last 50 years, and while Chicago’s population has gone down, the number of residents who own cars has gone up. Traffic along Montrose and Lawrence today isn’t the same as it was 50 years ago. There are simply more cars on the road now than when streets were originally designed and laid out. The city can ‘test’ all it wants, but all this will do is shunt traffic to other residential side streets. That’s the point. If the traffic isn’t all funneled down one street then we may have a chance of balancing out vehicle volumes so that no street is overburdened. If we can get all streets to have fewer cars than Manor handles today, then we would have a reasonable amount of traffic volume on all of our neighborhood streets. Once we know how a diverter affects traffic volumes, then we can know whether a different set of traffic calming measure may be needed similar to the Manor Greenway improvements. 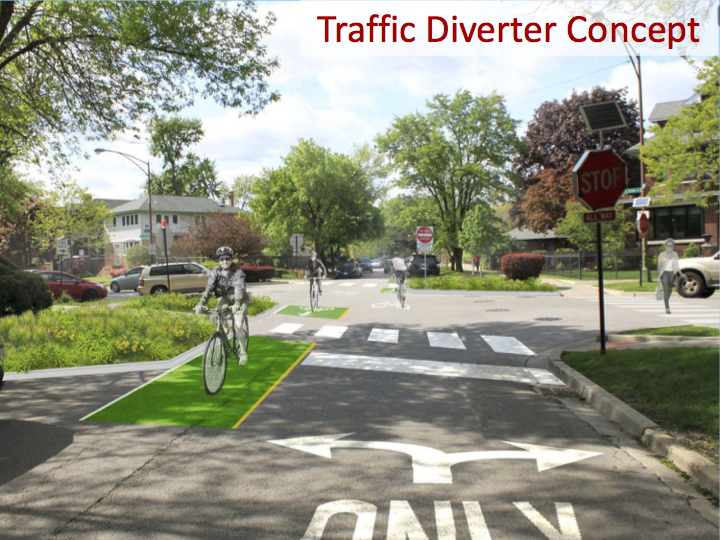 Because it is important to remember that this diverter test is a separate project from the complete streets improvements that make up the actual Manor Greenway project. Benches facing the buildings on Lawrence? Are these at bus stops? No, it’s the blue ones that hold only a single person. 2. two seats facing each other, but with a tree in between. Great if you want to inspect a tree, bad if you want to talk to your friend. LOL. News story today says 2018 for the Riverview Bridge. Alder. Deb Mell canceled the car traffic diverter, but some residents want the rest of the Manor Greenway proposal scrapped.